Here at IDS Security Systems we have been designing and installing security systems, and fire protection systems for decades. Our security engineers are capable of installing a range of advanced security systems, such as CCTV cameras, access control / door entry systems, intruder alarms and fire protection systems. 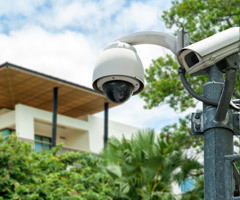 These security systems can be installed in commercial, public, or residential properties, so no matter what sort of property you own, we'll be able to install a security system to ensure it safe and secure! If you were worried about the standard of our engineers, you shouldn't be! Our security systems engineers have to undergo high level examinations to get a job here at IDS Security, and we can ensure you that each of our engineers are exceptionally qualified, and will do a thorough job when installing your security system. Not only are our engineers highly trained and qualified, but as a company we have had to undergo examinations ourselves, and we hold accreditation schemes that are respected throughout the industry. Having achieved these accreditations, and ensuring that our staff is thoroughly trained and qualified, it allows us to protect the welfare of our entire staff and it allows us to provide clients with the highest possible quality. Our security system engineers use their expertise to provide you with the level of technical know-how to get your security up and running. We also pride ourselves on being a friendly and approachable team, so whatever your questions or concerns, our security engineers are more than happy to help. If you require our security system engineers with your security or any of our other systems, please do not be afraid to contact us! Everyone should feel safe in their own homes, but often it is the case that we have to take some extra precautions to ensure the safety of ourselves and our properties. Here at IDS Security, we offer a range of security systems that are designed to keep your home safe - to learn more about the home security we provide, click here. One option for home security is the installation of home security cameras. Home security cameras not only deter crime, but in the event a crime is committed you can be assured that it has been recorded as evidence. This not only makes it far more likely any criminal will be caught by crime enforcement officers, but also that any of your property can be retrieved in the very unfortunate event it has been stolen. Home security cameras can provide invaluable security for your home. We offer a range of different cameras so that we can help you create a home security system that best matches your requirements. If you want to secure your house today with a home security camera do not hesitate to get in touch. We can help make sure that you have chosen the best security solution for your property, so contact us here for a quote.